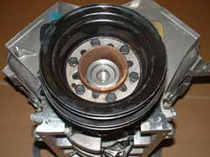 Converting a later distributor-less engine to the earlier distributor style. 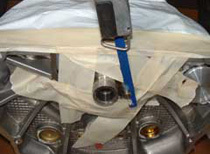 When converting a 4.0 or 4.6 litre engine to be used in place of a 3.5, 3.9 or 4.2 three small modifications are required. We can supply the below required parts and these instructions are free for all to follow. 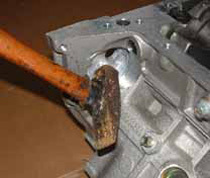 The old blanking plug has a hole in it for the crank angle sensor that the Gems and Thor engine management system uses. This has to be removed for our blanking plug to be fitted. Removal of this is very easy. Although welded into place, a small tap with a hammer will knock the old plug out. The blanking plug that we supply fits in place of the original and just needs some silicon to ensure it stays in place. 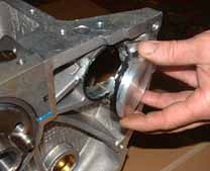 The dowel in the end of the crank shaft has to be removed to enable the flywheel to fit correctly. 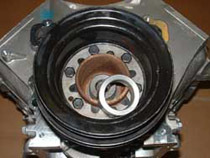 You should ensure that the crank seal is completely covered, and also the bottom end of the engine, so that no swarf can contaminate it. 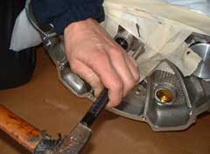 Using a hacksaw (or air hacksaw as seen here) the dowel has to be cut off as flush to the end of the crank as possible. A centre punch is then required just to knock what remains of the dowel into the hole so that it does not protrude from the face of the crank. 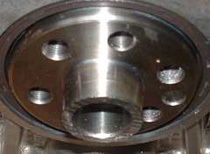 As seen here the dowel has been cut off and then punched back into the end of the crank so that there is no chance that it can interfere with the flywheel. 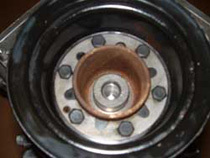 The crank is slightly longer, which means that when you do up the front pulley bolt, it would not actually come into contact with the pulley and therefor the pulley will be loose. 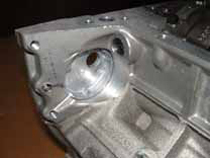 As you can see here we have made a spacer that fits over the crank end. 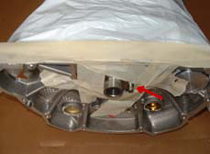 Now, when the pulley bolt is tightened, everything is pulled together as it should be.